Still, as beloved as violets are, they are considered weeds by many people, especially those seeking perfect lawns. Like most weeds, they are very resilient and have multiple strategies for reproducing. They thrive in partial shade and enjoy lots of moisture, and they can be stubborn to combat, resisting even repeated herbicide applications. Their dense, fibrous root system allows them to bounce back after mowing, and they can reproduce vegetatively via underground stems, or rhizomes. Violets spread by seed, too! When ripe, their Y-shaped seedpods explode with surprising force, shooting seeds far and wide. They also employ myrmecochory, or dispersal by ants. Violet seeds are coated with protein- and lipid-rich morsels, called elaiosomes, which are a tasty, rich ant treat. The ants gather the seeds and bring them back to their nests to feed their larvae. Once the coating is consumed, the ants discard the seeds in their waste piles, effectively planting the seeds—a beautiful example of mutualism! 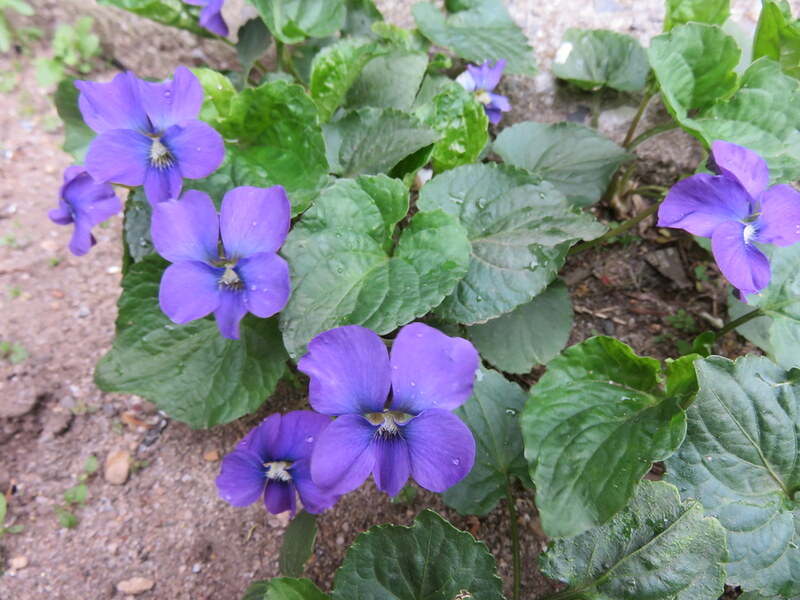 As if that weren’t enough, violets also produce cleistogamous, or self-pollinating, flowers. If you study a violet plant, you may notice strange, stunted-looking, oblong flowers that never open. These flowers have no need for pollinators—seed production can occur without them. Violets are also edible. Toss the young leaves and flowers into salad, candy the flowers, or crush the petals to color sugar for decorating. So perhaps give up on that dream of the perfect lawn and instead celebrate the violet for all it has to offer: a colorful delicacy, a botanical curiosity, an interrupter of the mundane, and a treasure trove of cultural history. butterfly. The snazzy caterpillar is black with branched spines that are orangish at the base with black tips. Viola sororia (common blue violet) is both a beloved native plant and a tenacious weed. Photo by Saara Nafici.